From the Hancock County Courthouse, go north on Hwy 15 for 7.3 miles to Mt. 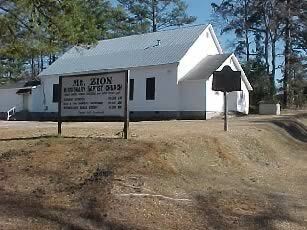 Zion Missionary Baptist Church. The church is on the right side of the highway, and the cemetery is behind the church. 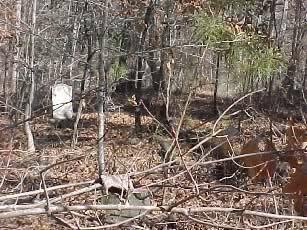 There are many graves (50+) in the woods, and several headstones have sunken so that you can see just the top of them. Graves numbered 400 and above have been listed based on obituaries. Based on the obituaries, these persons should be somewhere within the cemetery. Name from funeral home marker. Info from funeral home marker. Age 26. All info per funeral home marker. 2 mounds of dirt with flowers. TEC 5 U.S. Army (probably World War II). "In loving memory of our mother" "In God's care." Last name could be "Gunt". Mound of dirt with flowers. Depression with unreadable funeral home marker. Your children love you. Cynthia, Allison, & Bevedlyn. "A loving wife and mother"
From your loving son, Woodson Hill. Chipped slab. Slab in the same grave spot as Nikeria Erica Wade. Infant slab in same grave spot as William who has chipped slab. Gravestone reads: L___ H_od, 19__ - __90 Visitor at cemetery said it was List Hood, b. 1948 d. 1990 (cremated). 11 flagstones in this area. "Dada" We love and miss you. "Lovely Mother" "Prec. Member our BE"
"Deacon" Shares headstone with Marian Moss. Shares headstone with Elbert Moss. Handwritten - first name is written as "Arltur" - Arthur assumed. 37 flagstone markers and 6 depressions. Co. C 548 Engr Svc. Aged 50 years. "Blessed are the dead who die in the Lord." An unreadable funeral home marker and 3 flagstones. Age 4 years. Gone home. w/o Zack Smith. In a wire fence. Age 87 years. "God's finger touched him and he slept." Insided downed wire fence. Several graves (depressions) in rows in this area. Headstone sunken. Only the top showing. Age 60, per funeral home marker. In wooded area next to Hwy 15 in front of church. Last digit of birth year unreadable. All info from funeral home marker. Death date may be Jan 29. Age 37. All info from obituary. Age 80. All info from obituary. Age 62. All info from obituary. Age 57. All info from obituary. Age 97. All info from obituary. Age 83. All info from obituary. Age 50. All info from obituary. Age 94. All info from obituary. Age 53. All info from obituary.